Developed for the hybrid electric vehicle and autonoumous vehicle market, the first SATURN drives were shipped on February 17, 2016 for production vehicles by GROUP SIX. 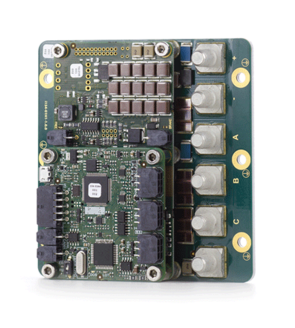 Designed and optimized for battery operation and re-charge, these high power, low voltage drives are unique in the servo drives market. On phases A, B and C using 3 terminal shunt resistors with isolation amplifier. Accuracy is ± 1% full scale. ESD & EMI protections: ESD protections are available in all inputs, outputs and communications. All inputs, outputs, feedbacks include noise filters.